with gold or silver craft paint. Keep in mind, you can use any color appropriate for the themed event.
. Use these shimmery lines to border your mask. After you’ve given a nice color and pattern to your mask, use your crafts glue to decorate your mask with the assorted feathers. Choose a stud according to your mask’s color scheme and paste in the center of your mask. This will hide the ends of the feathers and will add to the complete look of your mask. Once you’re done decorating your mask, poke a hole on the left and right end of your mask right alongside the eyes of the mask. Take your invisible rubber thread and cut it according to the size of your head. A great way to ensure a perfect fit is to insert the thread in one hole while holding the mask up to your face. This way you’re able to accurately measure the size from one end to the other. Now you can finally insert the other end of your rubber thread into its corresponding hole and tie a knot at each end of the thread. You can wear this mask to a party or showcase as in-home decor. 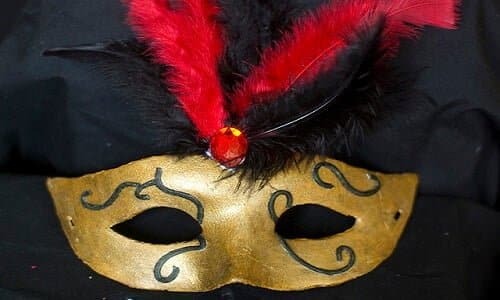 With this tutorial, you can now design a unique mask or attend an elegant themed party.